Cafe Aion is a Spanish & Moroccan inspired restaurant on The Hill, near CU in Boulder, CO. We connect with these cuisines for 2 main reasons. 1. The Style of Eating - We love being able to sample a variety of flavorful bites and sips with our friends in an informal manner. Also, gathering around large shared platters (paella!) is a wonderful way to share a meal. Both Spain and Morocco celebrate this style of dining. 2. Though we have no coast, there are many environmental and agricultural similarities between Colorado and these countries. We find local farmers and ranchers growing, peppers, onions, eggplant, lamb and many other wonderful ingredients that one would find in Spain and Morocco. Being able to cook traditional dishes with Colorado ingredients is the best! Tuesday Night Happy Hour — We love Happy Hour here at Café Aion and on Tuesday we offer specials on drinks and tapas all night long. You can find a great glass of wine or cocktail to pair with some of our favorite tapas, such as the 3-step wings, Tortilla Española, or pork sliders. 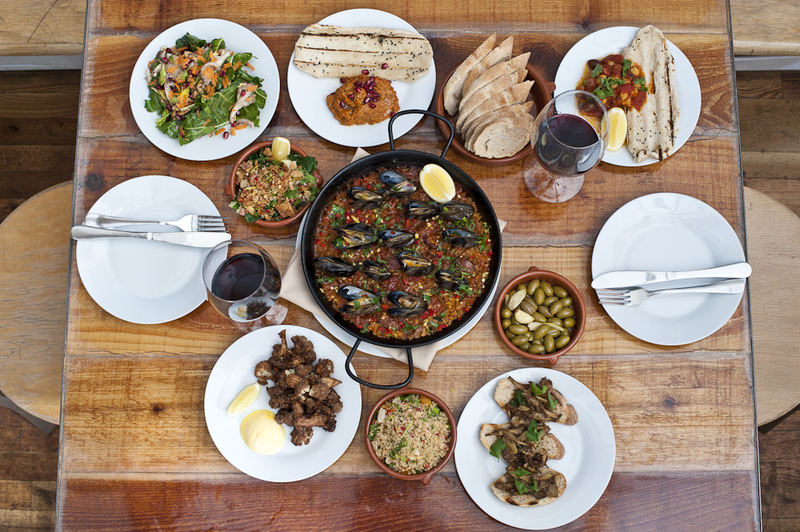 Paella Wednesday — Wednesdays are a big night at Café Aion: Paella and a bottle of wine for $49! We will create a special paella based upon seasonal ingredients and the regions of Spain and select a unique bottle of wine to pair with the dish. It is the perfect amount of food to share with 2-4 people. We think it is the ideal way to eat, drink, and enjoy a meal with your friends and family. Thursdays - Burger and a beer! We are celebrating Thursday with our special burger (bacon, brie, brioche bun & sweet potato fries) plus a Colorado craft beer for $15! You can substitute our house made veggie burger if you'd like. Brunch for Sharing - At Aion we love the idea of getting together with a group and sharing the dining experience. There is no reason brunch needs to be left out. We feature new dishes and drinks meant to be shared amongst a group during brunch and offer our freshly-fried doughnut holes by the dozen. Also, large paella pans of eggs, baked with savory mixtures of crispy potatoes and roasted peppers, topped with harissa or our house-made chorizo with caramelized onions & roasted yams. From the bar, our signature bloody marys will be available by the pitcher and you’ll be able to order a bottle of bubbles and carafe of freshly squeezed juice to mix your own mimosas for the table. All pastries are made in house and baked fresh daily! A Bottle of Bubbles & Carafe of O.J. Book online thru Resy by clicking below. Private Events: We love transforming our space into your own special event venue. Whether you’re thinking about hosting a rehearsal dinner, birthday bash, brunch or company party we’ve got you covered! Chat with our chef about options for an informal evening of tapas and mingling or a multicourse dinner: we are always happy to customize a menu just for you. Our full-buyout option is great for groups of 30 to 80 people. Large Groups: If your group of 8-30 people is looking a great spot to get together, consider us! We are happy to reserve our “Side-Bar” area for larger groups who might not need the full restaurant buyout. We offer lots of great options to personalize food and drink menus for your taste and budget. Catering: Looking for something new and exciting for your home party? Let us bring the flavors of Café Aion to you with our extra large paella pans (3’ in diameter!) and create a delicious meal with the ingredients of your choice. We are happy to round out the meal with cheese and charcuterie boards or a spread of tapas. CU Events – With over 7 years of experience hosting University affiliated events, we can make planning your next one a breeze. Our convenient location, easy tax-exempt and University card billing make your logistics hassle free. Dakota Soifer - Chef/Owner- Drawing upon years of experience working in nationally acclaimed restaurants such as Zuni Café, Julia’s Kitchen, and The Kitchen Café—and a summer with Meadow Lark Farm Dinners—Dakota’s menus and cuisine reflect a philosophy of crafting the best quality food into simple, soulful bites. Dakota combines a respect for and knowledge of high quality ingredients with a rare talent to craft them into immensely satisfying dishes. He doesn’t rely on tricks to impress his guests; just experience, expertise, and an understanding of the finest local products. Although concise, his menu of small plates is thoughtfully put together in a way that accommodates all tastes. And with a menu that changes daily to reflect what is seasonal, available and fresh, an incentive to try something new is ever present. -Dakota also recently won the popular cooking show Cutthroat Kitchen in season 4. 5280: Top New Restaurant 2010!